Outfit your child with clubs of proper length. 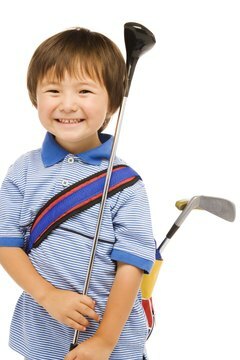 It used to be customary to give your child your old golf clubs when he wanted to start whacking balls around. Your toss-offs, however, won't fit many children, instructor Hank Haney asserts in Golf Digest. The shafts are too stiff, the grips are too big and the clubs are too heavy, even after being cut down. As a result, children who use such clubs are likely to swing at the ball with a flat arc. The result? Lots of chunks and low trajectory shots as well as lots of frustration. So do your child a favor and outfit him with clubs. Measure the height of you child. Compare his height to a chart showing the proper club lengths for various heights. Most manufacturers have a sizing chart. For example, a common chart for club makers and club fitters says that if your child is 3 feet tall, he should use a wood that is 26 1/2 to 27 1/2 inches long, a 5-iron that is 22 to 23 inches long and a 9-iron or pitching wedge that is 21 to 22 inches long. Adjust accordingly if your child is built differently from the norm. The charts offer general guidelines. However, if your child has unusually long or short arms for his height, he will need a shorter or longer club in order to ensure the lie will be correct when he assumes a normal stance. On the U.S. Kids Golf website, PGA master professional and coach John Godwin says that if the toe of the club head is off the ground because the length of the club is too long, your child likely will pull shots with every club in his bag.